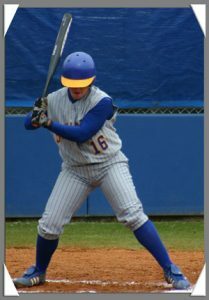 To help your hitters get into the proper Stance with their feet, have them put the bat down and pretend like they’re getting ready to field a ground ball. No doubt they’ll immediately bend their knees more and shift their weight onto the front part of their feet by tilting their chest slightly forward…the ideal body position for the Batting Stance. GOOD INFO/ IT’S NOT HOW HARD YOU HIT THE BALL, IT’S HOW YOU HIT THE BALL !